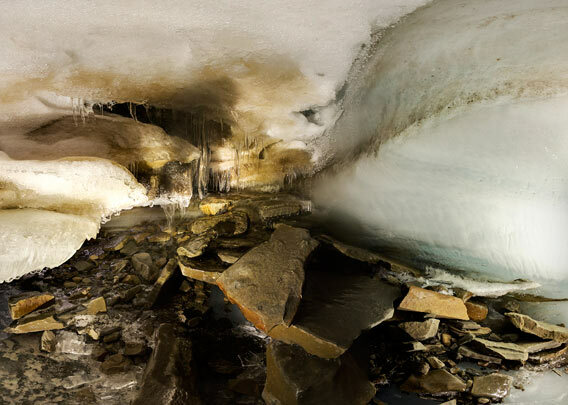 Some glacier caves (sometimes called ice caves) are easily accessible. It is absolutely fascinating to be inside a glacier! During the winter season, tours to glacier caves are regularly on offer in Longyearbyen as half-day and day trips on foot, ski, snow shoe, snow mobile, snowcat and dog slege. All glaciers close to Longyearbyen have glacier caves, not only Longyearbreen which is shown here, but also Larsbreen and Scott Turnerbreen in Bolterdalen. The latter is the main destination for dog sleges, as it is inside a snow-mobile free area, beautiful for silent travelling (the same goes for Larsbreen, but that is too steep for dog sledges). Glacier caves change from year to year. The glacier is moving and the meltwater is shaping the ice. Sometimes they are narrow and steep and difficult to access if not impossible. Other ice caves are easily accessible for everybody. Narrower, curved passages change with large halls – amazing! There are stalactites of ice and other fantastic structures. Unfortunately, they are fragile and easily damaged, so you will see more of them the earlier you come in the season. At least and in contrast to dripstones of carbonate rocks, they grow again quickly every years. The glacier cave shown here was in upper Longyearbreen and it was quite narrow. It was difficult to photograph it with panorama technique! 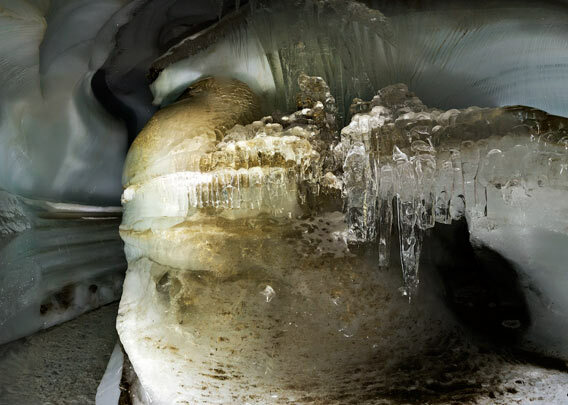 It goes without saying that glacier caves should only be visited with proper experience, knowledge and equipment. Guided tours are regularly offered in Longyearbyen if you are not an experienced cave-dweller.